It has been many moons since the Buick brand offered a high quality compact option but with the 2013 Buick Verano, General Motors has an affordable compact sedan that offers a luxurious interior, a superb ride and drivetrain that is both powerful and efficient that makes the Verano exactly what Buick has been needing. General Motors has long been criticized for using one vehicle with different badging across multiple brands and although the 2013 Buick Verano is based on the Chevrolet Cruze – the differences between the Verano and the Cruze are significant enough that each of these vehicles has a distinct personality of their own. While the Cruze takes more of a sporty approach to the compact sedan segment, the Verano brings a tremendous amount of luxury with a shockingly low price and more power while still maintaining the quality chassis design of the Cruze. While the 2013 Buick Verano is based on the same undercarriage as the popular Chevy Cruze, the two vehicles look completely different. In the past, two GM vehicles that shared a platform were hard to differentiate if you removed the badging but that is not the case at all with the Verano. Realistically, you would have to remove the majority of the body of both cars to have the Verano look like the Cruze. Instead of a Buick with some changes to make it not look like a Chevy, the 2013 Verano wears an exterior design that makes it look very much like the other models in the Buick brand lineup – which is a very positive aspect. Along the front, the 2013 Buick Verano wears a large grille that prominently carries the Buick tri shield logo in chrome and black as opposed to the Cruze that has a two piece upper grille separated by a body colored strip that carries the Chevy bowtie. The headlights of the Verano are smaller than those on the Cruze while a projection HID assembly with a blue LED trim ring gives the company Buick a much more upscale look. I also think that these new Buick blue halo headlights look super cool. They are fairly simple in comparison to many headlight designs but the addition of the blue trim ring adds a touch of high tech and a little luxury as these halo style lights are more common on far more expensive vehicles. The lower fascia has a set of projection fog lights mounted in chrome trim against flat black bezels while the large central opening wears more black mesh. Across the hood, the lines are somewhat similar but the addition of the familiar Buick triple opening vents add to the upscale look of the Verano. The side of the Buick Verano has a silhouette that is very similar to the Cruze, especially through the greenhouse lines, but the side lines of the Verano differ quite a bit from the Cruze while the doors, fenders and quarter panels have a more rounded form that gives this compact sedan a very fluid feel along the sides. The Verano comes fitted with 18” aluminum wheels as standard equipment that fill the wells nicely with a machined silver face that combines with the chrome door handles to bolster that luxury feel. Out back, the 2013 Verano continues to differentiate itself from the Cruze with a set of taillights running side to side with an integrated backup indicator while bright chrome ‘brows’ hover above each of the lens assemblies. These taillights have a very aggressive design that gives the back end an angry look and even though the Verano has less chrome across the back than the related Chevy – the overall design of the Verano’s rump offers a very classy look that is finished off by a chrome exhaust tip. While the Chevrolet Cruze is a great car, one of the best aspects of the 2013 Buick Verano is that this upscale compact sedan doesn’t look like a rebadged Chevy. The fact that GM has applied the general design language seen across the rest of the Buick brand so well to the Verano is a major part of why it is already so popular. The 2013 Buick Verano fitted with the Convenience Group and the Leather Group is – by every definition – a full blown luxury car in terms of interior amenities. You name it…from the leather heated steering wheel and heated leather front seats to the big, bright infotainment screen and the sophisticated gauge cluster with a driver information display…the Verano has it wrapped into an interior spread finished in leather, brushed silver and high gloss wood finishes. Best of all, in addition to the large touchscreen, the infotainment system is also controlled by large buttons and knobs that are easier to hit while driving for those who don’t remember that the Verano is also fitted with full stereo system controls on the steering wheel. This puts the ability to swap between the radio, the CD player, USB music files and XM satellite radio without taking their hands off of the heated steering wheel. In an era where many luxury vehicles are fitted with infotainment systems that have a massive learning curve – the Verano interior combines the gadgetry of the modern era with the ease of controls that you can only get from buttons and knobs. While the 2013 Buick Verano is a compact sedan, it makes excellent use of the available space to make for a comfortable environment for everyone. Up front, the seats can be adjusted to offer enough leg room, head room and shoulder room for a driver well over 6 feet tall. Mind you, when you have the front seats moved all of the way back to accommodate a very tall driver or passenger, the leg room in the back is still cut down quite a bit so tall rear riders will find it to be a little tight. However, the Verano will very comfortably seat two tall adults and two kids or diminutive adults with a good amount of elbow room for everyone. The heated front seats heat your buns in a hurry on a cold day while the dual zone climate control allows simple side to side temperature adjustments with a traditional button and knob setup that is straightforward and easy to use. Take the roomy seating spots, the easy to use HVAC system and the high end infotainment system that pumps the sound through a 9 speaker Bose sound system and add in the slick two tone interior featuring silver, chrome and wood grain accents and the 2013 Buick Verano offers the creature comforts of a far more expensive sedan – for just $28,435 as tested (including the $835 destination fee). 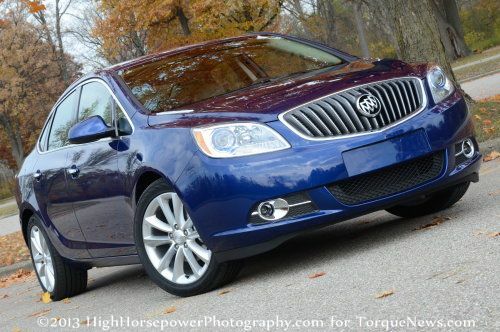 My 2013 Buick Verano test car was fitted with the standard 2.4L Ecotec 4-cylinder that channels 180 horsepower and 171lb-ft of torque to the front wheels via a standard 6-speed automatic transmission – a drivetrain configuration that isn’t offered in the Chevy Cruze. This makes the Verano one of the more powerful models in the segment while fuel economy figures of 21 miles per gallon around town, 32 on the highway and a combined number of 25mpg shows a fine balance of power and efficiency. Even better, during my time with the Verano, I averaged just shy of 27 miles per gallon with a 50/50 mix of city and highway driving. Over the course of a long highway drive, I was able to average around 33 miles per gallon on a long, desolate stretch of Michigan highway so those who are driving gently can expect to exceed the EPA numbers based on my testing. In terms of power, the standard 2.4L Ecotec engine of the 2013 Verano makes this compact sedan quite a bit peppier than the majority of the entries in the segment in terms of basic acceleration, higher speed acceleration and the willingness to climb into the higher speeds. It is no secret that the C segment hasn’t always been known for offering a spirited drive but even with the lack of a proper manual transmission – the Verano is impressively fun to drive with power to spare. On top of that, the refined suspension system of the compact Buick sedan provides great driving characteristics while cornering but more importantly, the Verano offers the quiet, smooth, comfortable ride that you would expect from a luxury sedan. Even when cruising on the highway, very little road noise is transferred through the chassis, suspension or steering assembly while the Buick Quiet Tuning system featuring acoustical glass and triple door seals further quiet the outside world – including wind noise at highway speeds. While driving the 2013 Buick Verano I ran into one of those driving situations that most drivers hope to never face and one that most cars couldn’t handle…although the Verano handled it very well. I was driving on a local Detroit highway with four lanes going the direction which I was headed. Due to an accident on the left shoulder, the left-most two lanes were moving at a crawl while the two right side lanes were moving freely yet at a speed well under the posted limit of 70mph. I was traveling in the inner right lane, cruising around 45-50 miles per hour when some moron in an Mercedes Benz SUV tried to pull out of one of the stopped lanes between my Verano and a truck traveling maybe 20 or so car lengths ahead. The Benz pulled out in front of me and then in seeing how close I was, she tried to pull back into the lane from wench she came. Unfortunately, she didn’t have room so she had essentially positioned herself directly in the middle of my lane – then came to a complete stop with the traffic in her lane. I had a faster moving tractor trailer (who was, of course, driving way too fast for the traffic conditions) barreling down on me from behind so I was forced to do one of the erratic lane change maneuvers that we often see in promotional “test videos”. Many cars when forced to swerve so suddenly at speeds around 50mph would either not respond and plow into the moron in the Mercedes or they would lose grip as the car swerved away from the clueless female driver. However, the Verano slipped around the stopped SUV like it was nothing...more like what you would expect from a sports car than a C segment luxury sedan. The 2013 Buick Verano combines a solid, comfortable ride with impressive handling capabilities and even more impressive power – all while maintaining realistic fuel economy goals beyond the 30mpg range on the highway. It has been a very long time since I could say “that new compact Buick sedan is actually very fun to drive” but with the new Verano – that is 100% true. It has been a long time since Buick has offered a competitive compact sedan and having driven many of the brand’s attempts in the past as well as many of the current competitors – it is clear why the Buick Verano has become so popular so quickly. The compact sedan market is all about offering the most content without compromising quality and the loaded up interior of the Verano with the Convenience Group and Leather Group offer pretty much every luxury feature you could want in a luxury sedan with a price under $30,000 – vastly less expensive than many of the luxury vehicles with which the Verano competes. If you are in the market for a compact luxury sedan that offers the full gambit of interior goodies, a powerful and efficient drivetrain, a sleek exterior design with a price well below $30k, the new Verano is the best small car that Buick has had in years while also being one of the best options in the segment.